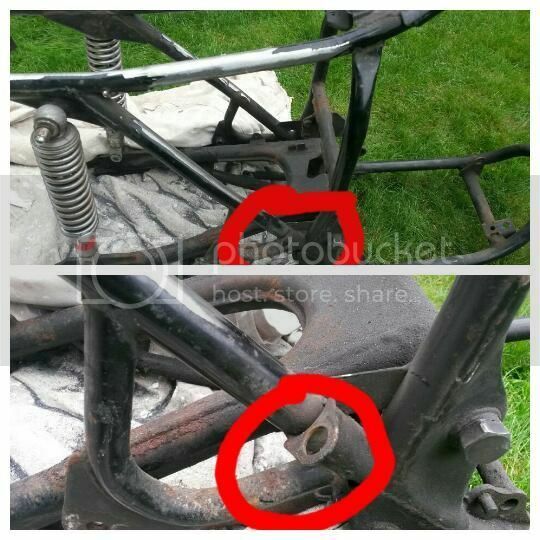 First attempt at grinding and de-tabbing on my build, before I tore it down I'd marked parts for removal however I'm starting to second guess myself, I marked the tab circled below for removal but now I'm thinking this is the bracket for the rear brake switch. Can anyone help or confirm? Yes stock rear break switch holder. Yes that is the brake switch mount. Will you be running rearsets or converting to disc in the rear? If so it will go bye bye anyway. If not, best to leave it for now. Cheers, good job I checked! I've sanded with a 120 grit flap disc, is there anything I can use to get a smoother finish? Will wet 'n dry work? I use hand files as a final cutting tool - only way I know to get flawlessly straight tubes after grinding. Then sandblast. Epoxy primer. Scotchbrite for sanding, then 2K urethane single stage. You can add clear or powdercoat instead for a different look, but if there is a better appearance to be had I have never seen it - mostly a matter of preference I suppose. As a rule, I use a welding process for any bodywork on frames and file things to shape, but am guilty of using glazing compound if I discover tiny defects once the primer is on. Agreed on NOT grinding length ways. V inconsistant. I get it close with a grinder and then use a vibratory sander for final finish. Once blasted and coated you can't tell there was any modification. If you are going hydraulic, get the banjo brake switch it's the shiz.